Coral in the Maldives is very important. The Maldives lies in two rows of atolls in the Indian Ocean. Each atoll is made of a coral reef that circles a lagoon, with deep channels dividing the reef ring. A string of islands take their places among this atoll ring. The islands have their own reef encircling the island lagoon. The coral reefs help protect the islands from wind and waves. 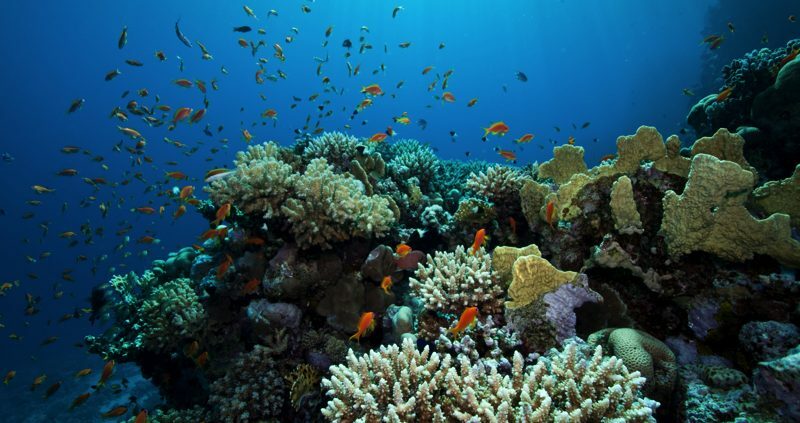 A coral reef is a community of living organisms. It is made up of plants, fish, and many other creatures. It is closely related to Jellyfish and Anemones. Coral reefs are some of the most diverse ecosystems in the world. Coral in the Maldives needs to be looked after, so that in turn it can protect the islands. The coral grows best in warm, shallow, clear, sunny and moving water. However, it grows very slowly, approximately 0.3 cm to 10 cm per year. Coral reefs are made of tiny animals called polyps that stay fixed in one place and are the main structure of the reef. Polyps have a hard outer skeleton made of calcium. Each polyp has a ring of tentacles shaped like a cup around a central opening. These are like long arms with tips that can sting you. They are used either for defence or to capture zooplankton for food. The coral in the Maldives supports countless species of fish and invertebrates. In fact the diversity and abundance of life supported by coral reefs is second only to the tropical rain forests. Climate change is affecting the coral in the Maldives. The temperature of the ocean is increasing, the warm temperatures killing off the symbiotic algae that lives within the coral and gives it its colour. This turns the coral white, known as bleaching. Coral in the Maldives is protected. You should not touch or stand on the coral and must never try to remove it from its underwater environment. Contact us today to book your holiday and a chance to see the fantastic coral in the Maldives.